Author(s): Jiyu Sun, Wei Wu, Weiliang Xue, Riaz Akhtar, Lei Ren, Jin Tong. Key Laboratory of Bionic Engineering (Ministry of Education, China), Jilin University, Changchun, 130022, P.R. China. Biomaterials are essentially complex viscoelastic composites whose mechanical properties are related to their inter hierarchical structure. Nanoindentation can be used to investigate local material properties by employing a small probe to induce local surface deformation. This technique is recognized as an effective mechanical testing method for biomaterials, facilitating the measurement of time-dependent and viscoelastic mechanical properties. However, it is very difficult to acquire accurate mechanical properties for viscoelastic biomaterials using quasi- static nanoindentation testing techniques due to surface size effects, indenter shape, and force frequency and loading function. 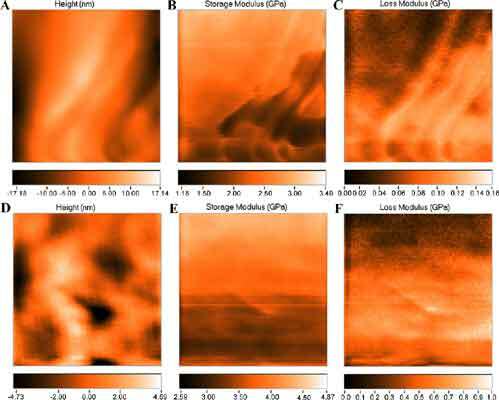 However, the dynamic nanoindentation approach has been successfully used to accurately investigate the viscoelastic mechanical properties of some materials. The application of small sinusoidal loading in nanoindentation has been used to investigate the dynamic characteristics of viscoelastic materials, including the storage modulus (Eʹ), loss modulus (E“) and loss tangent (tan δ). The objective of this study was to measure the viscoelastic properties of the cuticle of Harmonia axyridis Pallas (multicolored Asian lady beetle) by modulus mapping techniques on different color zones, the black spot region (BSR) and orange region (OR). Herein, the results are discussed in the context of the cuticle microstructure. Twodimensional (2-D) spatial distributions of Eʹ and E“ were mapped as functions of frequency in different color zones of Harmonia axyridis Pallas with the aim of shedding light on the nanomechanical properties of key structural features. Keywords: Colored beetle, dynamic nanoindentation, elytra, modulus mapping. Affiliation:Key Laboratory of Bionic Engineering (Ministry of Education, China), Jilin University, Changchun, 130022, P.R. China. Keywords:Colored beetle, dynamic nanoindentation, elytra, modulus mapping. Abstract:Biomaterials are essentially complex viscoelastic composites whose mechanical properties are related to their inter hierarchical structure. Nanoindentation can be used to investigate local material properties by employing a small probe to induce local surface deformation. This technique is recognized as an effective mechanical testing method for biomaterials, facilitating the measurement of time-dependent and viscoelastic mechanical properties. However, it is very difficult to acquire accurate mechanical properties for viscoelastic biomaterials using quasi- static nanoindentation testing techniques due to surface size effects, indenter shape, and force frequency and loading function. However, the dynamic nanoindentation approach has been successfully used to accurately investigate the viscoelastic mechanical properties of some materials. The application of small sinusoidal loading in nanoindentation has been used to investigate the dynamic characteristics of viscoelastic materials, including the storage modulus (Eʹ), loss modulus (E“) and loss tangent (tan δ). The objective of this study was to measure the viscoelastic properties of the cuticle of Harmonia axyridis Pallas (multicolored Asian lady beetle) by modulus mapping techniques on different color zones, the black spot region (BSR) and orange region (OR). Herein, the results are discussed in the context of the cuticle microstructure. Twodimensional (2-D) spatial distributions of Eʹ and E“ were mapped as functions of frequency in different color zones of Harmonia axyridis Pallas with the aim of shedding light on the nanomechanical properties of key structural features.